Mecum Indy may have come and gone but we’re not too worried because the auction house still has a dozen auctions lined up for 2015, which can only mean that there is going to be loads of tasty metal popping up on its website almost everyday. 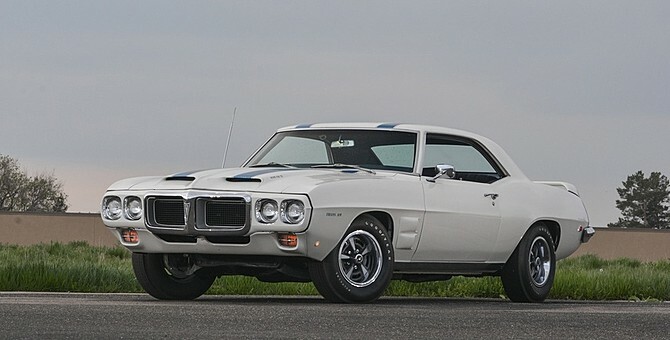 Take this 1969 Firebird Pontiac Trans Am, for example. While it may look like your “average” Ram Air IV, this particular example was just one-of-nine Ram Air IV automatic Trans Am Coupes produced that year. Nine. The fact it was just one of two built with the rare column-shifted automatic just makes it that much tastier. You also get power front disc brakes, power steering with external cooler, an aluminum intake manifold, while a pristine steel/fiberglass Ram Air hood helps add some visual punch. It also wears a period correct Cameo White with Blue Stripe paint job and killer Rally II five-spoke wheels wrapped in Goodyear Polyglas tires, which pretty much seal the deal in our books. Swing open the door and you’ll find a blue interior with bucket seats and a late production Formula steering wheel. The new owner shouldn’t have to worry about it too much, as it received a restoration in the 1990’s and professional “freshening” by Level One Restorations in 2010. Of course, all that will be accented by the 400 ci/345 hp V8 under the hood. Mecum doesn’t list the price but we’d surmise this Trans Am, with its highly sought-after Ram Air IV and super rare automatic gearbox, is sure to get more than a few paddles waving at the Denver Auction on June 26-27.